Listening to this word of Shanidev, Lord Shiva understood that Shani will do those things which he said, so he asked to Shani that how long Shani will be gracing him. Shani said, “My period for saade saathi is 7.5 years, so I will grace on you till 7.5 years.” But Shiva was not agreeing for this. Again Shani said, Ok, let me reside with you only for 5 years or at least for 2.5 years. But Shiva was not ready for 2.5 years, nor 7.5 months or even 7 days. 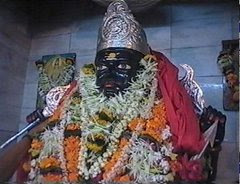 Then Shanidev thought it was too much for him as his disciple to be so cruel with him, because a Guru is like a mother - always compassionate always worthy for worship, so Shani bowed down to his feet and spoke in an humble voice, "I am very pleased with you, O my Lord, so ask for any boon you wish for." Lord Shiva said to Shanidev, "O Shani, if you are pleased with me, please bestows me this boon that you will not be entering my body at all." Previous day of this day, that city's both King's and the Prime Minister's son went for hunting. By the grace of Shanidev, they loose their way in the forest. The king was worried about his son and he send to their soldiers in the forest for searching of the princes. One of the search party went to Guru Shiva and asked him what was in his bag? Lord Shiva answered them that there are watermelons in this bag. Again soldiers asked, “Why this blood is dripping from your bag? Are you a murderer?” To hearing this word of the soldiers, Lord Shiva was shocked and looked at the bag, he also found that really blood was dripping from his bag. In the meantime those soldiers took off the bag from Shiva’s shoulder and opened it. They found that two severed heads in it. Those heads were of those of Princes and the prime ministers son’s. By the gaze of Shanidev, the watermelon had changed into the heads of those two boys. Lord Shiva left the palace. On the way God Shiva met the executioner, Shiva gave him all the coins. After that Shanidev met to Lord Shiva. Shanidev asked, “What is the experience of my gaze?” Lord Shiva said, “O shani, you are great, only 3 hours and 45 minutes gaze shattered my bones, what would be happened if you had stayed with me for 7 and ½ years? Taday I am agree that you are most terrible planet. I can bear all this things but today you promised me that you will not trouble anyone else like this in future.” Shanidev said, “O my lord, I am sorry for that, but I just wanted to show you my power. Now please pardon this child of yours, and I promised that I shall never offend you in this way again." After saying this word and bowing down to lord Shiva, Shanidev went back to his Shanilok. After this story, it is concluded that Shanidev is the powerful god and good judge.